Like a medieval Book of Days, each page of Eduardo Galeano's "Children of the Days" tells an illuminating story inspired by that day of the year, resurrecting the heroes and heroines who have fallen off the historical map but whose lives remind us of our darkest hours and sweetest victories. It would be unusual to call a book like this endearing, but that is what it is. Galeano’s little folly of a book is uplifting despite the fact that it unearths depressing reminders of human frailty and cruelty throughout recorded history. It is a light-hearted manual of resistance, a restorative tonic. The latest work by famous Uruguayan writer Eduardo Galeano is an almanac of alternative history with a page devoted to each day of the year, offering succinct reminders of historical moments and events that celebrate human courage and intelligence and the wisdom of the natural world. The anecdotes at times evoke major events in world history – many deal with slavery and imperialism – but there are also less well-known and more inspirational and ironic stories about individuals that have slipped through the net of official history. March 7 marks the day that the English parliament debated a law to punish “perfidious females” who seduced and tricked His Majesty’s subjects into matrimony using “scents, paints, cosmetic washes, artificial teeth, false hair, Spanish wool, iron stays. hoops, high heeled shoes or bolstered hips”. March 13 was the day in 2007 when Chiquita brands (successor to United Fruits) admitted to financing Colombian paramilitary gangs – paying a fine of 25 million dollars, not a penny of which reached the families of their victims. November 14 was the day Nelly Bly, the Mother of Female Journalists, set off on her round-the-world trip in 1889. It was not the young reporter’s first exploit nor would it be her last, which was published 30 years later dodging bullets on the front lines of World War I. This book will come as a surprise to those who are expecting a more historical and radical account similar to Galeano’s renowned Open Veins of Latin America (famously presented to Barack Obama by Hugo Chavez). However this “Calendar of Human History” reveals the more relaxed voice of a distinguished thinker and writer who has cast his net wide to educate, entertain and amuse in an inspired fashion. The book is a challenge to its readers to reconsider history and elevate the forgotten moments of individual heroism that have nevertheless formed the foundation of our lives and collective thoughts. 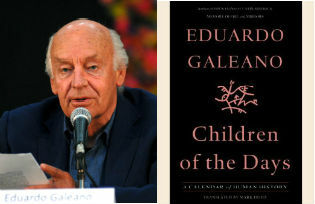 Galeano is at times frivolous – but with political intent – like when he recounts a “smooch-in” in Brazil to protest against a dictatorship that banned kisses which “undermined public morals”; or the day when “sacrilegious women had the effrontery to marry each other” in a church in Galicia in 1901 and, a personal favourite, when he tells us about Abdul Kassem Ismael, the grand vizier of Persia, who kept books safe from war by creating a walking library of 117,000 tomes aboard 400 camels, forming a mile-long caravan. This is a book of great humanity, highly recommended. 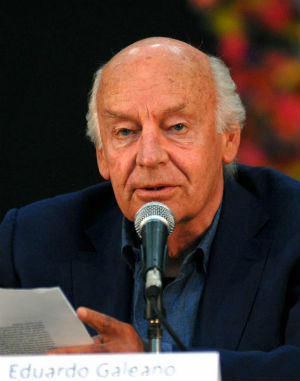 Eduardo Galeano is one of Latin America’s most distinguished writers. He is the author of the three-volume Memory of Fire as well as Open Veins of Latin America, Soccer in Sun and Shadow, Days and Nights of Love and War, the Book of Embraces, Walking Words, We Say No, Upside Down, Mirrors, and Voices of Time. Born in Montevideo, Uruguay in 1940, Galeano lived in exile in Argentina and Spain for years before returning to Uruguay in 1985. His work has been translated into thirty languages and he is the recipient of many international prizes.